Dry Ice Blasting | FCS, Inc.
FCS, Inc. fields an experienced dry ice blasting team providing a non-destructive deep clean of industrial surfaces. Our ice blast cleaning service removes grime and preps surfaces for new paint. Paint, rust, oil, grease, and other common industrial soils are effectively removed with a dry blast cleaning process. CO2 dry ice blasting can effectively decontaminate surfaces of Salmonella enteritidis, E. coli, and Listeria monocytogenes. The dry ice media blasting will sublimate without residue. It is a dustless blasting method. In fact, the EPA recommends dry ice blasting as an alternative to many types of solvent-based cleaning. The dry ice blasting method was used on this industrial scrapper. Dry ice blasting removed well over 99% of the residue and sanitized the device without disassembly. FCS, Inc. blast cleaning services allow facility managers to safely clean a wide range of production equipment without disassembly or a producing fire/electrical hazards. Dry ice blasting is especially useful with complex production equipment. The FCS, Inc. team can provide a high quality dry ice cleaning without the need for breaking down the assembly line, which saves both time and money. Striping grime, rust, and paint from industrial platforms and equipment requires a powerful mix of basic chemistry and pressure. When used as a blasting media, dry ice is not as abrasive as sand or plastic beads. Dry ice blast cleaning is a dustless blaster. In the sublimation process, the dry ice absorbs a large volume of heat after striking the surface and vaporizing. The cryogenic cleaning produces shear stresses on the surface due to thermal shock. The dry blast cleaning method improves cleaning as the top layer of dirt or contaminant is expected to transfer more heat than the underlying substrate and flake off more easily. 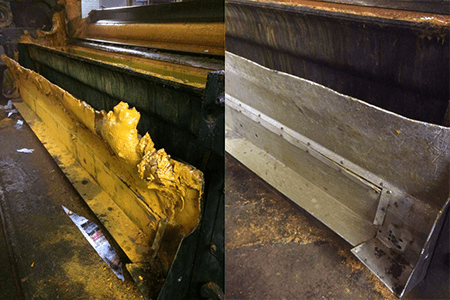 Unlike other forms of media blasting, dry ice blasting effectively lifts dirt and paint from surfaces while minimizing surface deformations and pitting created by other media. FCS, Inc. provides a maintains a competitive dry ice blasting service that will clean your industrial spaces at a competitive price. FCS, Inc. is a licensed, insured, Avetta Certified, and an ISNetworld Certified building service contractor. Ask us to bid! We provide free project quotes. After you contact us, we’ll arrange an initial on-site visit and listen to your needs. We target 72 hours or less for visiting your project site within our general service area. When our bid is accepted, we’ll schedule your project with our teams, strive to exceed your expectations, and beat your deadline. For contact, please complete our all-hours Inquiry Form or call 434-250-5901 during normal business hours. © 2019 FCS, Inc. All Rights reserved.